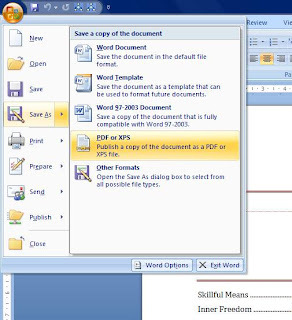 It is possible to publish Word documents in PDF format just in two clicks in Word 2007. All you have to do is to download and install "2007 Microsoft Office Add-in: Microsoft Save as PDF or XPS" from www.microsoft.com. (Hint: search for the above phrase at that site). After installation, a menu item as in the screenshot to the right appears. XPS also seems to be a filetype like PDF but it is open source or something, I'm not sure. Today I brought this certain DOCX file from home and at the internet cafe I'm horrified to find that Word 2007 is not available in the cafe's machines. Well, why worry, internet's got the answer to every problem. So I googled "Docx to doc converter" and followed the top link. And it was a pay-and-convert site! So I added "free" to my keywords and searched again. Then results led me to several sites all of who requested my email so that they can send me the converted file. I followed their guidelines and waited for about 10 minutes only to find no reply in my inbox. Tried another site with the same result. Getting f rustrated I finally tried www.convertfiles.com and in just a second I got the converted file as a link in my inbox! Thanks, ConvertFiles! In the site you can, in fact, convert most file types, not only documents. You can access the hidden context menu in Vista by holding down the shift key before right-clicking on a file or folder. One of the coolest features in the new menu is Copy As Path. By choosing this, the path of the selected object is automatically pasted in the clipboard so you can paste it elsewhere. Otherwise, we would have to open the properties dialog of the file to copy its path, but even then you would not be able to copy the full path. When you shift-right-click a folder, the context menu gives you the option Open Command Window Here. This will open a command window (DOS prompt) with the selected directory as the current directory. Many of you will find this quite a handy feature. The hidden menu also has some shortcuts to pin the selection to start menu, add to quick launch, etc. You have typed this certain document having several pages with lot of effort in the Word 2007 format, or perhaps the document may span several hundred pages. And now you have to convert the document to 2003 format. But will the converted document be exactly a clone of the original? Well, you can find this out by clicking on the Office button (to the top-left screen) and selecting Prepare->Run Compatibility Checker. It gives a list of warnings on what will happen when you try to convert to 2003 format, and their number of occurrences. For example, I got the following warning recently: SmartArt graphics will be converted into a single object that can't be edited in previous versions of Word. This compatibility checker is available in other Office packages as well. The site describes itself as the File Extension Source. Type in any file extension in the search box to the left and it will instantly display several results, and in my case I got the required result at the top. The result includes the meaning of the extension, the company with the copyright and the programmes used to open a file with the extension. In my case it was Adobe Illustrator (Should have guessed that before!). I no longer blog here! Diagnosed with a rare variation of Abnormal Psychiatric Disorder. Can pronounce Eyjafjallajokull.